If you are one of the unlucky people who is suffering from Plantar Fasciitis then read on for some great tips to keep you running successfully with Plantar Fasciitis. Stop your arch and heel pain once and for all. Plantar Fasciitis is a very common foot injury that affects nearly 8 million Americans each year. Its definition is very simple. Plantar is a term that refers to the bottom of the foot. Fasciitis is referring to the inflammation of the fascia. Fascia is strong, fibrous connective tissue that attaches to your heel bone (calcaneus) and runs past your metatarsal joints (ball of the foot). Any connective tissue in our bodies has one primary job which is to support our skeletal structure. Without it we would just be a big sack of bones. That is always a great question for me. The cause of Plantar Fasciitis for most people foot and leg biomechanics. So what is biomechanics? Simple put, biomechanics is the structure and alignment of your bones, and in your case it is how your hips, knees, ankles and your foot are aligned. Improper alignment can lead to foot, ankle, knee, hip and back pain. 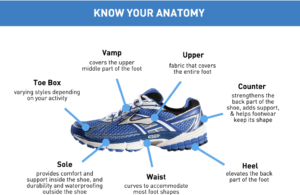 If you are dealing with Plantar Fasciitis you need to take a close, hard look at the type of footwear that you use while running, working out and your casual shoes. In all cases it is best to wear a lace up shoe that allow for adjustability and ankle support. Athletic shoes with a slight heel elevation and a firm heel counter will provide the best support for Plantar Fasciitis. Shoes that will aggravate or increase your Plantar Fasciitis pain include, flip flops, most slip-ons and shoes with flexible soles. Lose the heel pain fast! Since no shoes will totally prevent or cure Plantar Fasciitis we know that it is important to use a high quality foot orthotics to totally eliminate your heel pain. Choosing the right orthotic can keep you running successfully with Plantar Fasciitis. 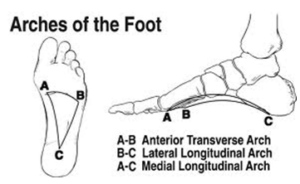 In order to support the foot properly an orthotic must support the three arches in your foot and redistribute the weight bearing on your heel. Yes, I said three arches, the medial arch, lateral arch and the transverse arch. To see an illustration of the three arches take a look at the foot diagram to the right. 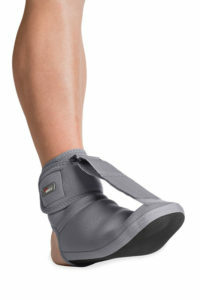 Our Ultimate Heel & Arch Support was designed specifically for Plantar Fasciitis. It supports all three arches of the foot. It is the best way to make a good shoe – great! 2-3 day shipping is standard! There are many different types of foot stretches that can help with Plantar Fasciitis but we are big proponents of non-weight bearing stretches. We believe that when your foot is injured it is important to mildly stretch the connective tissue. This can properly be done thru non-weight bearing stretches like this illustration below. This simple stretch can be done in bed, at work or any time you are sitting in a chair. The “No pain – No gain” phrase should never apply to someone recovering from an injury. With any injury it is always important to get adequate rest for quicker healing. Reducing your milage and slowing down running speed are essential to curing your heel pain once and for all. We suggest you cut back 50% on milage and a 20% cut in your speed for the first 10 days. This will allow less strain and impact on your injury and will surely speed up the healing process. using a soft night splint. The all-night stretch that a soft splint offers has provided many people relief and speeds up your overall recovery. 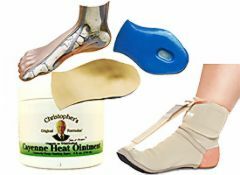 We recommend using the night splint in conjunction with our Dr. Christopher’s Cayenne Heat Ointment. This penetrating salve is excellent for increasing blood flow to any injured soft tissue. Increasing the blood flow will speed up healing to any damaged muscles or tendons.